The state of Burgenland with the capital Eisenstadt is located in the east Austria, It is bordered to the north by the Slovakia, to the east Hungary, in the south on a few kilometers Slovenia and in the west to the two Austrian provinces Lower Austria and Styria, Viticulture has been important here for at least two and a half millennia, as evidenced by the regionally modified saying by the historian Johannes Aventinus (1477-1534) "Extra Pannoniam non es vita; si est vita, non est ita "is underlined (outside of Pannonia you can not live, if you can live, then not like here). The place Zagersdorf counts beside Stillfried in the Weinviertel to the oldest wine growing communities in Austria, because in one Celtic Grave mound from the Hallstatt period about 700 BC Grape seeds were the cultural vine Vitis vinifera discovered. In the first century BC, the Romans invaded Danube and founded the province of Pannonia (historical landscape in western Hungary, to which today's Bgld. counted, which only came to Austria in 1920). A new wine culture was formed by the abolition of the vine planting prohibition by Emperor Marcus Aurelius Probus (232-282). At that time the Roman legionaries were entitled to three measures of wine per capita per day. In 433 AD, King Huns Attila conquered the province of Pannonia. The turmoil of the migration of peoples had a very negative effect on viticulture and only emperors Charlemagne (742-814) led a reconstruction, inter alia, by introducing nobler ones Frankish Sorts. Wine from their own vineyards in the Buschenschenken (wine taverns) to be allowed to pour, great animation. The biggest merit is the Cistercians attributed to the swampy and wooded area drained and cleared. In 1216, they already cultivated 99 vineyards in Heiligenkreuz (Lower Austria). 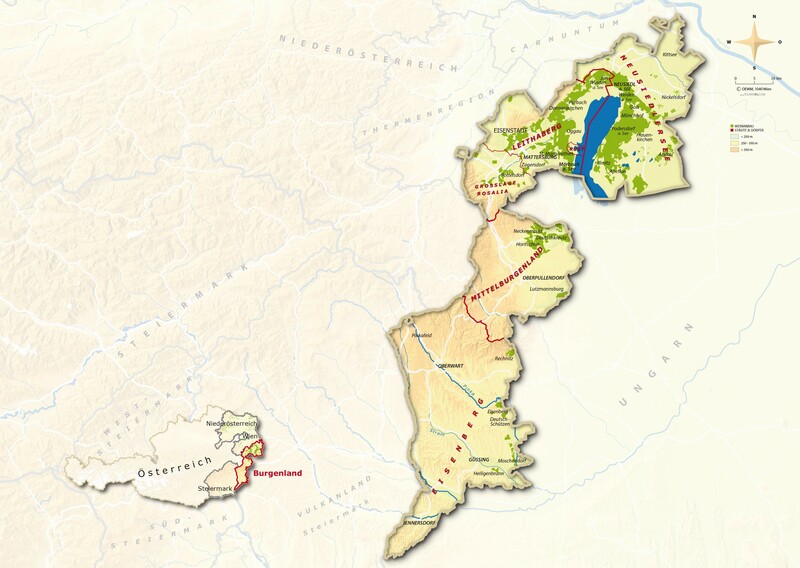 From here, they started around the Neusiedlersee to create monastery Marienberg (near Oberpullendorf) and around St. Gotthard more wine crops. In the 16th century, the vineyard had reached the largest extent and viticulture had become the main source of income. The Hungarian Queen Maria (1505-1558) granted Burgenland winegrowers great privileges. She lent the wine places Rust. Jois and Neusiedl on the lake the right to label their wine barrels with the initial letters "R", "G" (for Geusz) and "N". The famous Ruster outbreak was created at that time and the Tokaj equated. Burgenland was particularly affected by the many Turks in the 16th and 17th centuries. Despite all the turmoil of war, epidemics, Wetterunbilden and other strokes of fate was the period from the 16th to the 18th century, the absolute glory days of Burgenland viticulture, which were mainly produced at this time white wines. Large quantities were delivered to the imperial court cellar in Wien and the particularly popular Ruster wine received the honorary title "Vinum imperatorum - imperator vinorum". At that time there were four quality classes in Burgenland: Vinum Nobile (fine wine, dry berries of the grape variety Furmint), Vinum Bonum (quality wine from Furmint, Augster and Muscat), Vinum Mediocre (medium quality) and Vinum Cibale (table wine). In 1622, Count Nikolaus received Esterházy (1583-1645) from the Habsburg Emperor Ferdinand II (1578-1637) the dominions of Forchtenstein and Eisenstadt assigned as a fief. This noble family promoted viticulture and wine trade and became the largest landowner in Austria. At the beginning of the 19th century, the Golden Age was over. Due to the Napoleonic wars and crop failures large vineyards had to be abandoned and rededicated to farmland. In the second half of the 19th century also in Burgenland the phylloxera to. Great merit in the fight was acquired by Paul Vetter Gols, The area is by Pannonian-continental climate, the climate-regulating influence of the 230 km² Neusiedlersee and relatively long vegetation times of up to 250 days. Due to the excellent climatic conditions, the Burgenland is ideally suited for viticulture and is considered the red wine region of Austria. Well-known Burgenland Winzergenossenschaften and vintners associations are Blaufränkischland. Pannobile. Pannonian dance. Renowned wineries Burgenland (RWB), Weinidylle Southern Burgenland and Winzerkeller Neckenmarkt, The wineries are listed in the wine regions.